it is only 2/3 complete, but it has been a good weekend thus far. I stitched like crazy Friday and Saturday afternoons – such progress I made! but alas, it is far from complete, and I had hoped to take it with me to my brother’s picnic today. Oh well, I will keep working on it and send it along when it is finished. So far I have found two places where I counted wrong. One was bad enough to pull everything around i tout. The other is one I think I can disguise when the rest of the background gets done. and cast on the 21st pair. And that was just the start of it. In addition to a healthy dose of yard work, I also finished cleaning out all the stitching magazines in the craft room. Check it out! That is a 2.5 inch binder, now full of clipped articles and patterns. It is all that remains of the magazines. And all of those magazine holders which were jammed full are empty. I have one that is less than half full of the things I saved. Next up – knitting magazines. I likely will not be as successful in emptying things, but I at least will get them organized and in date order. Then, a scary set – the paper crafting magazines. But lets not move too fast or it will seem overwhelming and nothing will happen. But I have all week, right? Saw Dad and step mother S there – we rarely see them as they live so far away, but they came up for several days, apparently, and so we got to visit with them. They have Tigger’s two sisters, so that was a bit sad, hearing about them, and knowing Tig is no more. Also saw aunt V and cousins B and M, always fun to see them. They don’t live far away,relatively speaking, but we live very different lives so we don’t see each other often. On the way home, we stopped in Augusta to shop at Staples – A needed a few things. It happens to be right near AC Moore, so I had 20 minutes to race through the store. 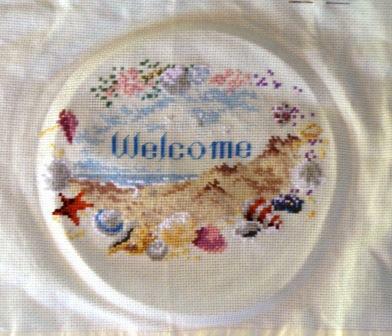 I was really looking for a frame for the cross stitch – but I can’t do that in a hurry, I decided. I did, however, grab a few small pads of 6 x 6 scrapbook paper for cards and a rubber stamp. I also got 5 tiny little canvases for some multi-media art I want to try,. We will see if it fares better than the last ones I did. Tomorrow we hang about at home – if it is nice, A wants to go to the driving range in the morning, but otherwise we are home and puttering. One thing we are working on is technology. We are actually going to hook up our wireless hub – no more long cords to the computers. 🙂 then the TV will be even more spectacular, and since DISH Satellite still has not resolved the contract issues with our local CBS, it will be great to be able to watch it online. I did hook up an antenna to the TV up in the craft room, and so we do get the channel up there, but it is not comfortable for sitting and watching TV ( unless you are also crafting, of course!). Not sure how we will resolve that, but we will before the new NCIS season starts. Antenna did no good on the big TV in the living room, sadly. Craft room giveaway 2 winners! So congrats to littleblackdogsa, saracrafts, and jenniesisler. Wish I could link to your blogs, but still having issues with many of my screens. I’ll send off packages as soon as you send me your mailing addresses! Author salpal1Posted on August 29, 2014 Categories how it came outTags giveaway, winner3 Comments on Craft room giveaway 2 winners! Friday list, last of August! Well, A and I had all sorts of good plans for a week off at the same time this coming week. But now she has to work all week. Not just that, but on the road. Sigh. I thought about going with her for a few days, but there is so much work to get done around here, that I think I won’t. Then, I didn’t finish all I had hoped to at work this week, so likely I will work some this coming week, too. have coffee on the deck and paint my toenails. draw the winning names on the craft room giveaway and get those packages ready to mail. work on my yard work – pool prep is STILL in process. Can I finish it this week? a trip to the PO, the grocery store, etc. catch up on my reader when WordPress and I figure out why it is BLANK and fix it. Really. WordPress comes up with something new for me each week. Crazy. Yes, I probably should get another browser, but I am lazy. I have my laptop from work, maybe I will see if things are working right on that, and if so, it gives a clue. I hope you all have fun, productive Fridays to start off your weekend – a holiday one here in the US – yeah! Author salpal1Posted on August 29, 2014 August 28, 2014 Categories how I plan to spend my day, what I am makingTags chores, knit, long week at work, to-do list, vacation, WIP8 Comments on Friday list, last of August! Today is the last day to enter the craft room giveaway part 2 – don’t procrastinate now, I’ll be drawing the winners tomorrow. You can see the prizes and learn more about how to enter here. Author salpal1Posted on August 28, 2014 Categories how I plan to spend my day, what I am thinking about, What I loveTags crafts, cross stitch, deadline, giveaway2 Comments on Last day to enter! This morning I sorted through a magazine box full of patterns of all sorts. Well, I went through them trying to be realistic about what I really will stitch, or what I could foresee myself stitching as gifts. After I set those aside, I had a large pile – too good to toss, too many to keep. That means – another giveaway! Here’s how I will work it – comment here and I will put your name into a drawing for each lot. Want more chances? Share this post, and link back so I know you did it, I’ll give you five more chances – all on one lot or one in each, however you decide to split them up. I’ll ship anywhere, so no need to worry about that – if you get mail, I will get these to you. All entries must be submitted by midnight Thursday night, August 28. I’ll draw the winners Friday morning. Where we were – A’s sister K has a camp by a lake for the week, and invited us to spend the afternoon with her. We were glad to do so! 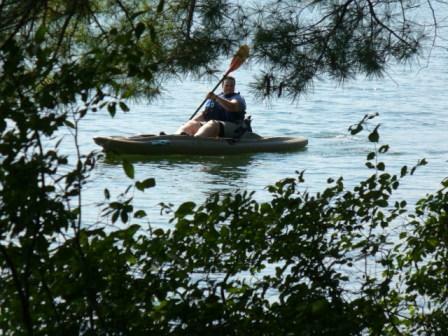 What we did – all things water-related – tried out the new Kayak (that’s A speeding along! ), went swimming, threw the frisbee countless time for the dog to swim and fetch. It was a nice peaceful summer Sunday afternoon. Every day I look at this sign and laugh. I did not alter it at all. 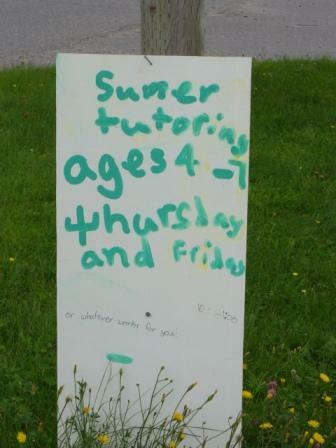 If, by chance, you wanted “Sumer tutoring” for your 4-7 year old, I don’t know how you would get it as there is no phone number or other contact info. 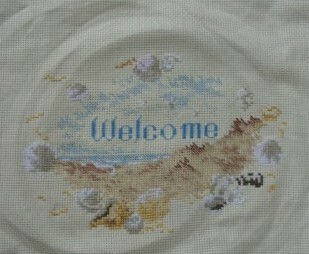 The stitching is coming along, but I don’t think I will get it finished by next Sunday, when I wanted it ready. Oh well, I will keep plugging away at it and it will get done eventually, right? I worked on it out on the porch today – natural light makes a huge difference in how well I can see it, I found. Even then, it goes slowly. I am also working on this shawl – I just love how the blues are looking on this – while it is hard to see any progress simply by looking at the photos I take, I feel better when I am counting the points – working on number 24 now. 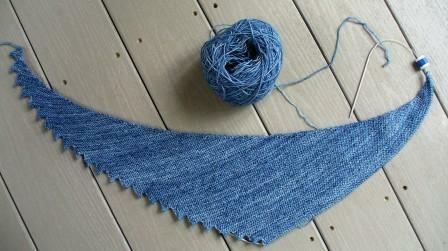 Not sure that I will get to the 42 the pattern calls for, I’ll just keep going until the ball is done. It is a Madeline Tosh, Tosh Light, in Betty Draper’s Blues. So soft and lovely. It is a single ply yarn, all wool, not as dense as the sock yarn. It is making lovely fabric. That’s it – the photos I couldn’t load to the last post worked fine now. Thanks, WordPress!